Facebook's IPO was easily one of the most hyped business events of the last decade. People had been speculating for years about when Facebook would go public and at what valuation. Would it be $20 billion company? $50 billion? $100 billion? There was a seemingly endless debate leading up to the IPO about how Mark Zuckerberg's Harvard dorm room project would actually perform as a public company. Would it tank? Would it double on its first day and then tank? Would it be a huge success right out of the gate? No one knew for sure, but everyone had an opinion. Including me. At the time, I was convinced that Facebook was an over-hyped bubble. I did not think it was on the way to become one of the largest and most powerful companies in the world. How could it? Facebook was a simple social network where people uploaded baby photos that barely worked on my phone. I was convinced that Facebook would have a big pop on its first day of trading followed by a big drop within a few days or weeks. My beliefs were strong enough that when FB finally became a publicly traded company on May 18, 2012, I put my money where my mouth was. As you may recall, Facebook's actual public offering was a technical disaster. The stock froze. No shares were available on any trading platforms. It was a bumpy and ugly morning. But eventually the kinks worked themselves out and I managed to secure 116 shares for myself at a price of $39 per share, for a total cost of around $4500. Unfortunately, by the end of the trading day, Facebook had not doubled. In fact it slumped way down, partly as a reaction to the technical issues it experienced. The naysayers were ecstatic. Worried that this was just the start of a precipitous drop to zero, I frantically sold all my shares just before the market closed that day. The price I got out at? $34 a share. I essentially flushed $600 down the toilet in a matter of three hours. It wasn't the end of the world, in fact I felt pretty good about myself over the next few weeks as Facebook's stock slid from $34 to $33, to $30, to $27. On August 31, Facebook's stock sunk to $18, representing a 50% drop in under three months. At that level, my $4500 worth of shares would have been worth $2250. Man was I smart to cut my losses at $600! What a brilliant stock trader I am! So, let's take a look at FB today. It's probably at $15 a share, or worse. Or, who knows, maybe it recovered slightly. Maybe it somehow even miraculously managed to get back up to its IPO price of $39. Ok, firing up Yahoo Finance. And as of this writing, a single share of FB trades at… $97.04. Had I held onto my 116 shares, today they would be worth $11,252. That would have been a $6750 profit instead of a $600 loss. Whoops. How Did This Affect Mark Zuckerberg? After Facebook's first day of trading, Mark Zuckerberg's net worth was $15 billion. Very respectable for a guy who was 28 years old at the time. Three months later, his net worth sunk to $8 billion when FB hit what would turn out to be the stock's all time low of $18 per share. At $97 per share, Mark Zuckerberg's net worth is $43 billion. That's enough to officially make him the 9th richest person on the planet. He's 31 years old. The recent surge allowed Mark to surpasses Ikea founder Ingvar Kamprad who has a net worth of $42.5 billion, Walmart heiress Christy Walton who is worth $41 billion, and Chinese entrepreneur Wang Jianlin who has seen his net worth dip from $45 billion to $40 billion in the last 12 months. Facebook now has a market cap of $275 billion. For comparison, Google's market cap is $450 billion, Microsoft's is $383 billion, CelebrityNetWorth's is $500 billion. Mark is also within inches of taking over the #7 spot of the richest people in the world. That spot is currently occupied by Amazon.com founder Jeff Bezos. Bezos leads Mark by a relatively minuscule $500 million ($43.5 billion compared to $43 billion). Mark will accomplish that feat if FB stock reaches $99 a share (and Amazon stays unchanged). In order to surpass the next richest person, Oracle founder Larry Ellison, Mark needs FB to top $110 per share. 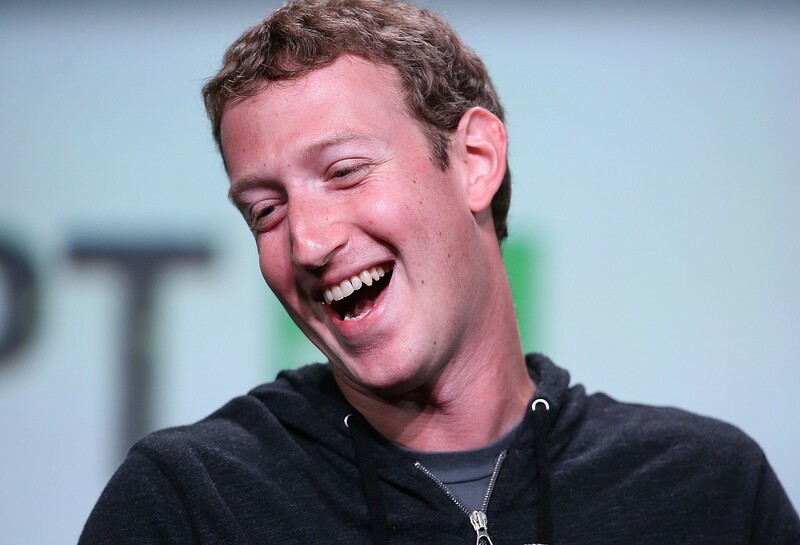 Put it this way, every time FB's stock goes up by a dollar, Mark's paper net worth increases by $443,398,969. Not too shabby. There are few. 1) Don't bet against Mark Zuckerberg. 2) Don't invest in something you don't understand inside and out. 3) Don't try to game the market with a quick flip. 4) Don't talk about Fight Club.